Va Harry S. Truman (8 Boaldyn, 1884 - 26 Mee ny Nollick, 1972) ny 33oo Eaghtyrane ny Steatyn Unnaneysit. V'eh ayns oik veih 12 Averil, 1945 derrey 20 Jerrey Geuree, 1953. V'eh ayns oik ec jerrey y Nah Chaggey Dowanagh. Hooar eh baase ayns Kansas City, Missouri ayns 1972. 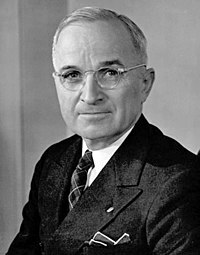 Ta tooilley coadanyn mychione Harry S. Truman ry-gheddyn ayns Wikimedia Commons.